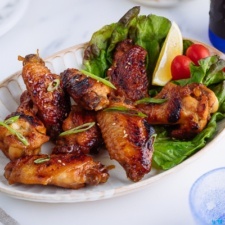 Cooked in one pot and finished up in the broiler to get the perfect char, these Teriyaki Wings are sticky and finger-licking delicious! They are unbelievably easy to make too. Once tried, they will be loved and cooked many times. If you are looking for a crowd-pleasing and winning recipe for chicken wings, this is The One for you. 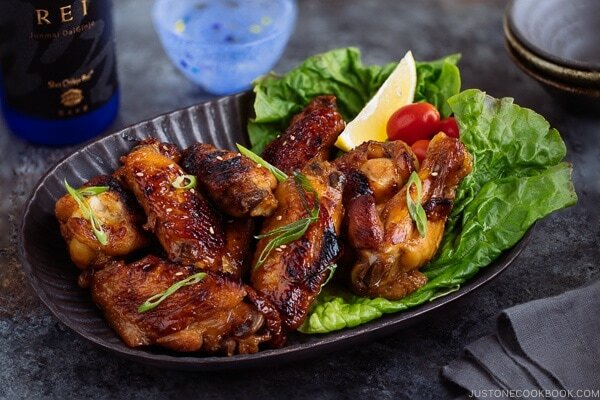 Tossed in a classic Japanese sauce, these Teriyaki Wings (手羽先の照り焼き) would go hand in hand with many occasions. 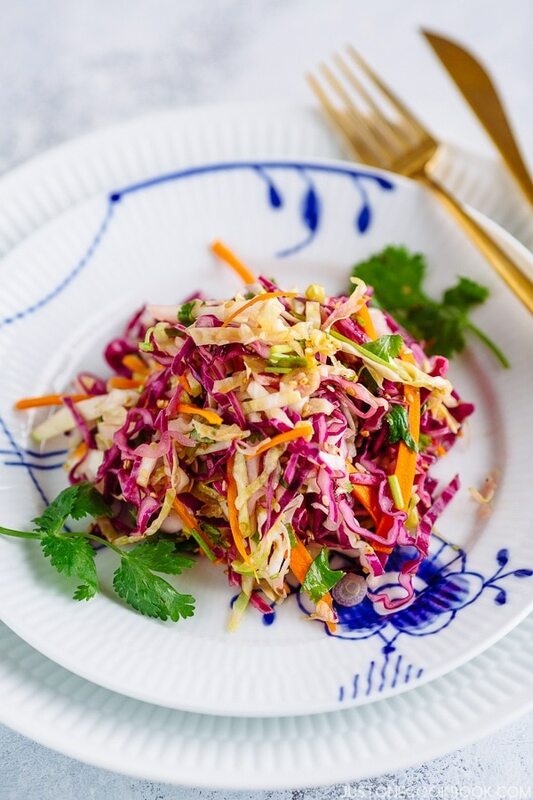 Think weeknight meal, game day, potluck, birthday party, picnic, friends get-together, and many more! It’s pretty much fuss-free and guaranteed deliciousness. How do we make those finger-licking delicious Teriyaki Wings? Here are three simple things to consider. Good quality chicken wings are a must. 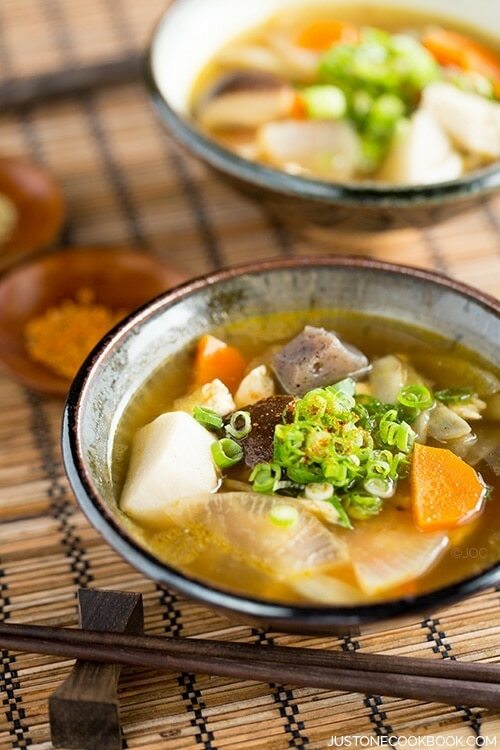 The sauce must have a good balance of salty (from soy sauce) and sweet (from sugar or honey) flavors. Decent amount of char on the chicken brings a deeper, more robust smoky flavor. When you make “teriyaki” recipes, the 3 most important ingredients are soy sauce, sake and mirin. 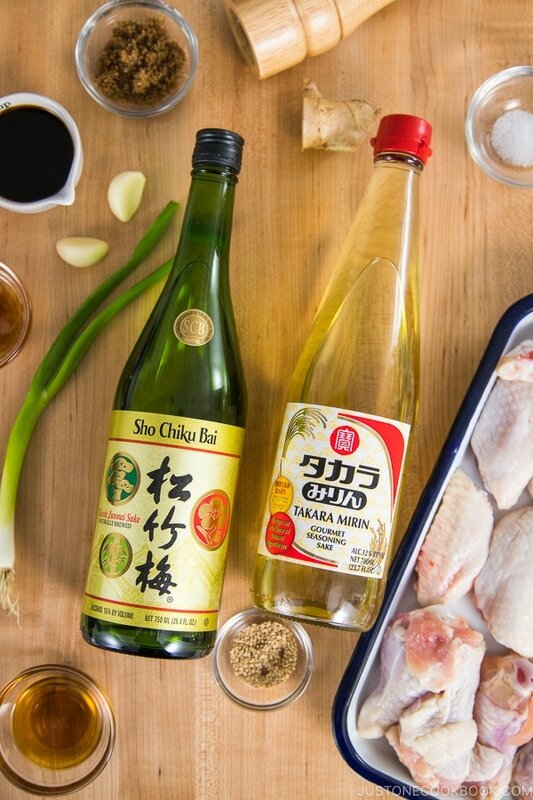 For this Teriyaki Wings recipe, I partner with Takara Sake and used Sho Chiku Bai Classic Junmai Sake and Takara Mirin (shown below). 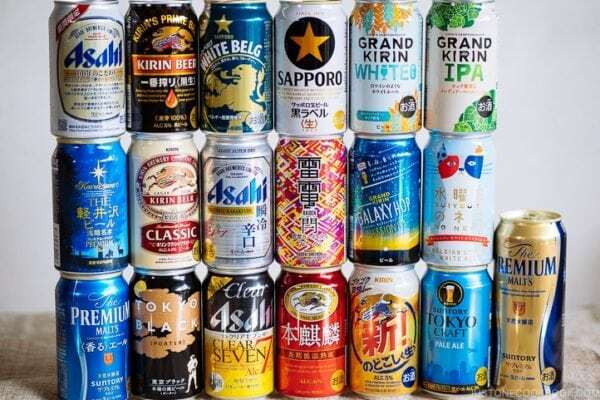 Takara Sake is also a huge brand in the U.S., so you can easily find their sake and mirin in Japanese grocery stores, Asian grocery stores, and some liquor stores. Are Sake and Mirin Important? Can We Skip It? 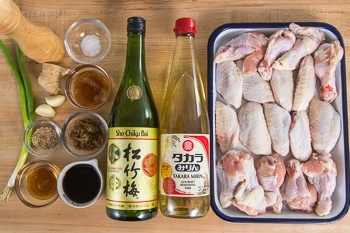 When comes to making the sauce for Teriyaki dishes and in this Teriyaki Wings recipe, sake and mirin are two ingredients that cannot be overlooked. They play significant roles in helping to tenderize the meat and enhancing the overall flavor and aroma of the dish. I have a comprehensive blog post about sake and mirin, where you will learn more about each ingredient and the benefits of cooking with them. Any Halal Substitute for Sake and Mirin? Sake: Water is the only substitute I can think of. 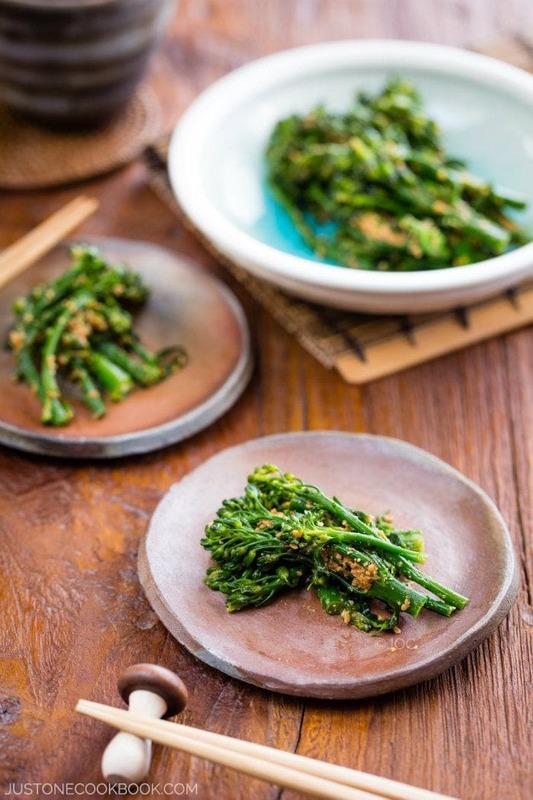 Mirin: Look out for Honteri Mirin by Mizkan which contains no alcohol. Or you can substitute mirin with water and sugar. The ratio of water and sugar should be 3 to 1. For example, for 1 tbsp water, mix with 1 tsp of granulated sugar. One of the cookware that is good to own is a Dutch oven. I have several Dutch ovens by Le Creuset for different purposes but if I have to pick one, this 4.5 QT Dutch oven probably gets the most used for my daily Japanese cooking. If you make soups and stews for 4 people, 5.5 QT Dutch oven may be your best size. Here are three reasons why I love cooking in Dutch ovens and I think every home cook should own one. Versatility – Whether you are using a Dutch oven on the stove or in the oven for baking bread, making stew, or braising these chicken wings, it is a magical piece of cookware that can handle versatile cooking. Even Heating – Dutch ovens provide even heat distribution to your food. There are no “hot spots” on the bottom of the pot. It also has a nice tight-fitting lid. No Seasoning & No Rusting – Because of the enamel coating on Dutch ovens, there is no need for seasoning before use. Unlike traditional cast iron cookware, which is prone to rusting when it’s not seasoned properly or when submerged in water for long periods of time, enamel coating on Dutch ovens protects it from rusting, allowing you to boil water, soak and place it in the dishwasher. 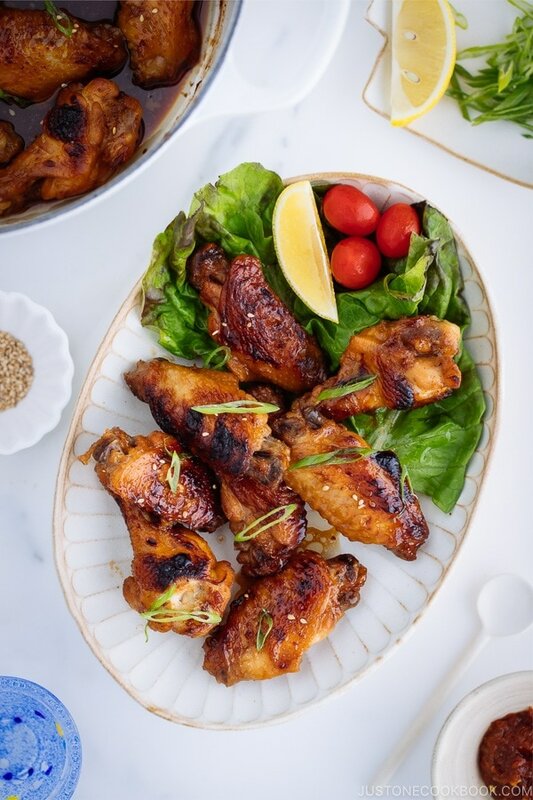 To make these teriyaki wings in the Dutch oven, it basically involves two simple steps: 1) simmering the wings over the stovetop until well coated 2) A quick broil under the oven. 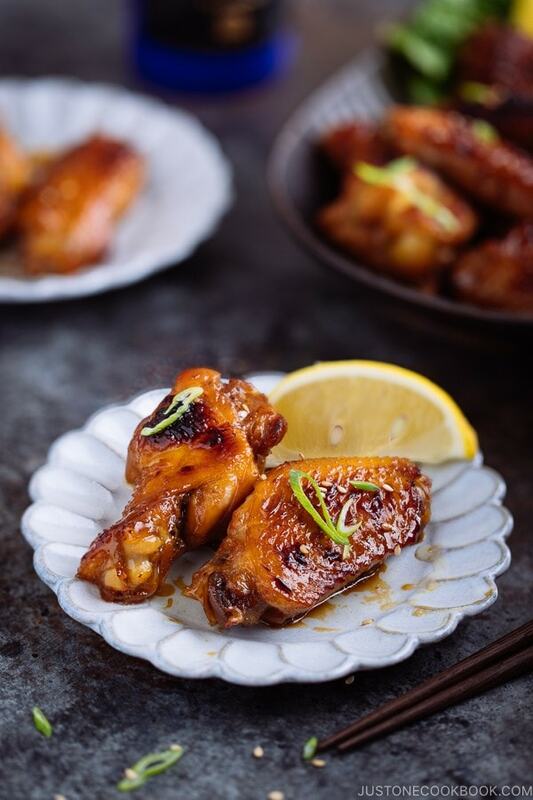 And out comes these Teriyaki wings that are sweet, savory, very sticky with perfect char. 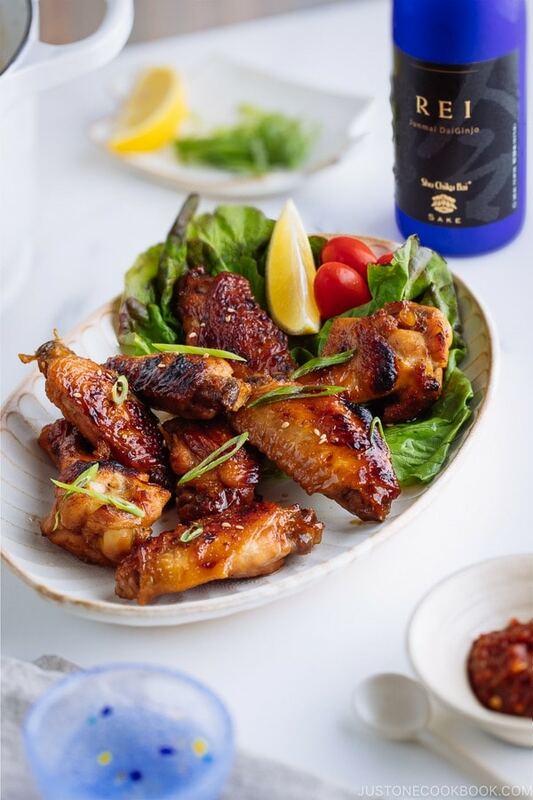 For this teriyaki wings recipe, we paired it with the very versatile REI Junmai DaiGinjo from Takara Sake. This delicious sake is made in Berkeley California with Cal-rose rice polished to 50%. Unlike most daiginjo sake which is sipped by itself, Takara sake created REI to enjoy with food. As you pick up REI in the sake glass (chilled), the distinct clean and fresh aroma of high-quality sake slowly infuses your nose. Once you take a sip of REI, you would notice how smooth it is right away. Hints of melon, cucumber, and melon hit your taste buds gently. Inside your mouth, the sake evolves to more floral and fruit flavors with a slightly dry finish. The best part of REI stands out when you enjoy it with food. 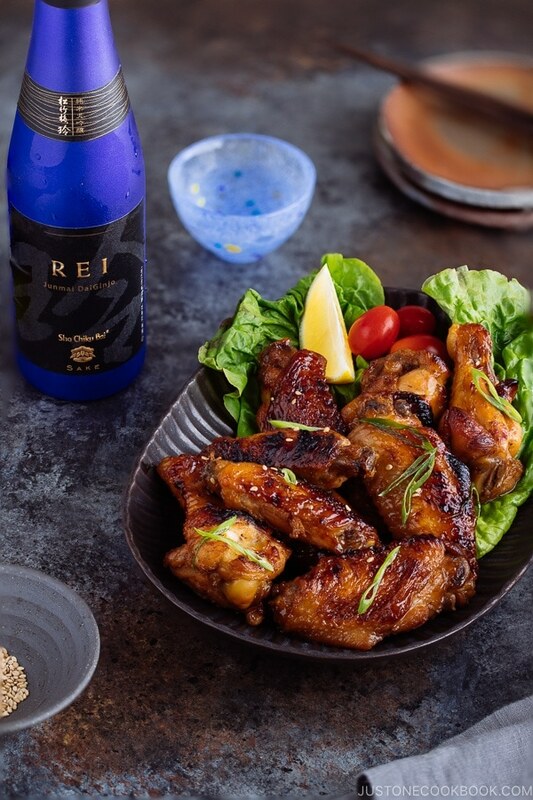 When we drank it with the teriyaki wings, the sweet soy sauce enhances the characteristics of REI by amplifying its natural sweetness and the subtle underlying flavors. It was a perfect match! Besides teriyaki dishes, Takara sake also recommends trying REI with tempura, yakitori, sukiyaki, and sushi. It comes in a small 300 ml so it’s perfect for 1 or 2 person meal. If you can’t find it in your local market, you can buy it from Takara sake online. Grate ginger. Measure 1 tsp of grated ginger and save all the ginger juice for later use. Place the chicken wings in a large bowl and crush 2 garlic cloves with a garlic press (or mince the garlic). Add 1 tsp grated ginger and ¼ cup sake. Add ⅛ tsp kosher salt and freshly ground black pepper. Rub the chicken wings well with your hands until they’re completely coated in the mix. Heat the Dutch oven (I use Le Creuset 4.5 QT) over medium heat. Once it’s hot, add 1 Tbsp sesame oil and distribute evenly. Add the chicken wings in a single layer, trying not to overwrap. If you cook more than 2 lbs chicken wings, you will definitely need to cook in batches. Some parts of chicken wings may get overlapped, but that’s okay. Cover and cook on medium heat for 4-5 minutes. After 4-5 minutes have passed, open the lid and flip the chicken wings. Now, if you are using a pot that is NOT oven-safe, then you want to brown the chicken wings nicely at this stage. Don’t turn the wings often and let the wings get nice brown char. You may need to increase the heat slightly, depending on the pot you’re using. Cover again and cook for another 4-5 minutes. Then uncover and check if the wings need to brown more. Add 2 Tbsp honey, 2 Tbsp brown sugar, ¼ cup sake, ¼ cup mirin, and ¼ cup soy sauce. Lastly add all the ginger juice (roughly 1 tsp) and make sure all the wings are coated in the sauce very well. Lower the heat and simmer for 15 minutes, until the sauce is reduced and most of the chicken wings are exposed from the sauce. When you’re about to finish simmering, preheat the broiler for 5 minutes. Place the Dutch oven in the oven and broil for 3-4 minutes. Stay in front of the oven to make sure you don’t burn the chicken wings. My rack is in the middle and heat element is not too close to the chicken wings. Broiling time varies depending on how far your wings are from the heat element. Thinly slice the green onion (green part only) diagonally, and sprinkle over the wings, along with the sesame seeds. Serve immediately. Hi Pat! If you don’t want do the oven step, you want to make sure your chicken wings look nicely brown (charred) and delicious. So before you finisih Step 9, you should make sure all the wings have nice color. 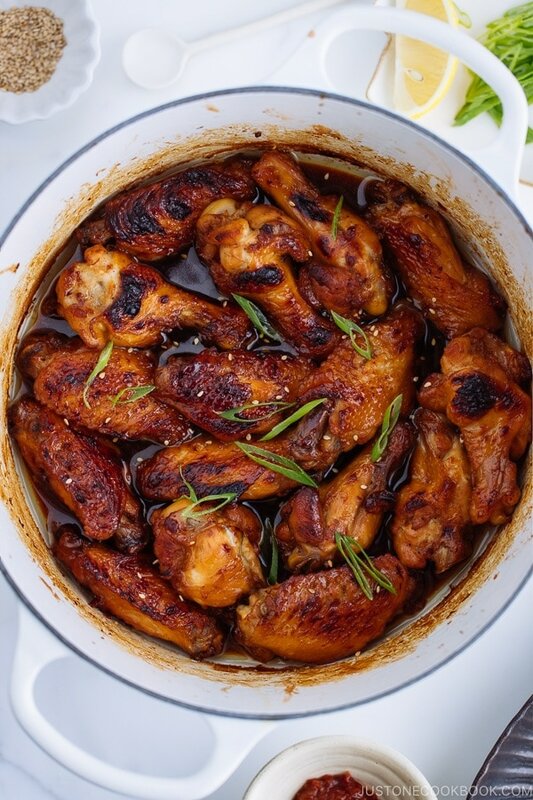 Now, if you put too many wings, you end up “steaming” inside the pot, so do a few batches. The broiler helps to make the skin crispy (not only giving char). Unfortunately you can’t do that without the oven. But my kids love it with just braising. Hope this helps! Made this tonight, it was awesome, thanks. I did make the following changes. Added a teaspoon of chilli powder with the ginger at the beginning, no Le Creuset available so I used a large dia frying pan with another for the lid. and reduced the cooking liquor down with the chicken till it was very very thick then picked out the chicken and placed onto a tray and placed under the broiler till crispy. Ultra sticky, awesome flavour and will do it again. Hi Charles! Thank you so much for trying this recipe already and I’m happy to hear you enjoyed it! Think you’ve missed out garlic in Step 3, although your picture shows a garlic presser. 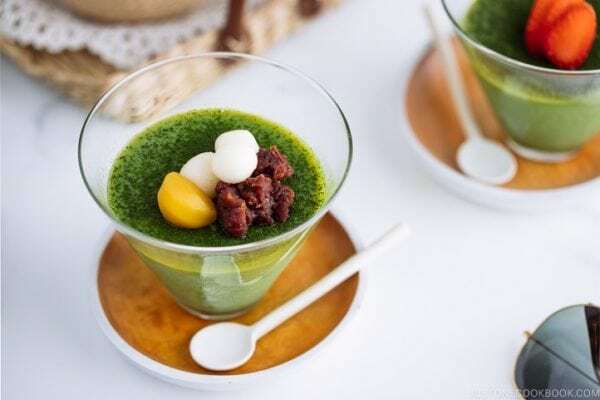 Hi Nami, thank you once again for this awesome recipe! I made a batch this afternoon and we are having trouble keeping it for dinner. It’s an easy and fast to cook meal for the week night. Both my fussy eaters love the wings! Most importantly, the ingredients are easily available since I am living in India. Truly grateful for this recipe. God bless! Katsudon was delicious!!!!! I will give it 10 stars out of 5. Hi nami, it seems like my oven doesn’t have a broil function. Can i replace the broil to a Grill mode or other modes in the oven, and if so at what temperature? Thanks!